In a coveted central position, locally known as Hideaway Island on the edge of popular Noosa Sound, this is no ordinary house. Featuring spacious living under some 382sqm the home will comfortably accommodate up to 10 guests. With a playpark and oval at the back fence and handy river access it’s an ideal setting for a family holiday. There are 3 large en-suited bedrooms, a separate powder room, sunlit lounge-room, two dining areas, an office, media room plus of course a large pool to enjoy in an oasis-like garden setting. 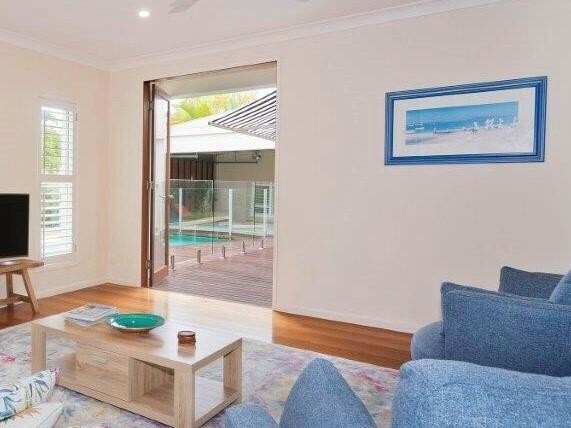 Over 2 levels, the home exudes luxury and is located amongst some of the best homes in Noosa. In one direction, just a short stroll via the restaurants of Quamby Place will deliver you to iconic Hastings St, Noosa Main Beach and Noosa National Park. In the other direction, the restaurant precinct of Gympie Tce and the Noosa River in Noosaville awaits. Note: Minimum Tariffs apply for each season based on Minimum Nights, however stays can be shorter than the minimum nights, subject to the minimum tariff being paid.